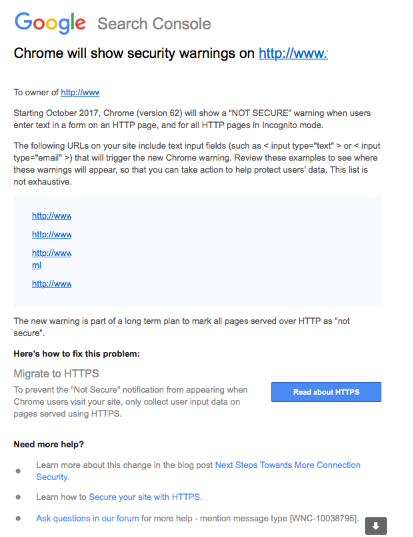 Last month, Google sent a series of messages to Webmasters via Search Console to inform them that Chrome would soon be displaying a ‘not secure’ message on pages with data entry forms on pages without HTTPS. If you ask your website visitors to enter any form of data, for example contact details, on a page that is served on HTTP and not HTTPS, the user will see a ‘not secure’ message. This will naturally impact the perceived trustworthiness of your website. 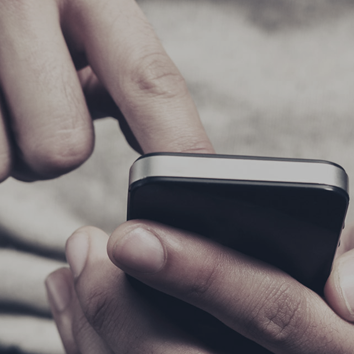 Conversion rate is likely to be affected, as users are prevented from taking action on your site due to concerns over the security of their data. Even pages with basic input fields (e.g. a search box) will display the ‘not secure’ warning, and are likely to see lower engagement and greater exit rates as a result. Google Chrome is an extremely popular browser. It is responsible for approximately 64% of traffic in the UK. Therefore to avoid seeing revenue and/or conversions fall, we advise anyone affected to switch to https. It’s a straightforward process and the cost is relatively low at around £150 for an SSL certificate depending on who hosts your site. 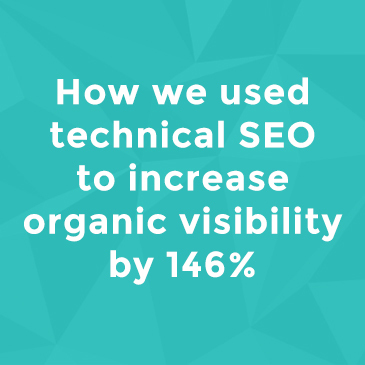 However, if implemented incorrectly it can have negative SEO implications. See our checklist below for how to migrate to https. Google have confirmed there is a small ranking boost for pages on https, although they describe it as ‘very lightweight’. The issue for SEO is more around user signals – if a user clicks your listing but quickly returns to search to click a different result, this is a good indication to Google that your page was not a suitable or satisfactory result for that query. This is often referred to as dwell time or long vs. short clicks (not to be confused with bounce rate, which Google insists is not used as a ranking factor). The non-secure warning will be a big factor in many a searcher’s decision to quickly leave your site, resulting in increased bounce rates and poor performance relating to these user signals. Rankings are likely to drop as a result. Without the correct implementation, there is a danger of sending conflicting signals which will cause rankings to drop. For example, if your canonical tag still points to the http version rather than the new https version, Google will treat the two as separate pages which can cannibalise each other. We’ve seen impressive improvements in visibility from correcting this type of cannibalisation and would expect equally significant drops if the issues were to suddenly appear en masse across a website. – Implement / test the migration in a staging environment first! – Install a good quality SSL certificate on the server – these can be purchased from companies such as Comodo, Verisign, Thawte etc. DO NOT use a self signed certificate as that will not be trusted. – Internal links – we’ve mentioned links in content but there’s also images, js etc. If you need any help or advice on migrating your site to HTTPS please give us a call on 01204 897264 or drop us a message via our contact form.